Dubai, 10th September, 2018: Bloomberg and the Misk Foundation have begun the second edition of their intensive, week-long financial journalism training program in Dubai for Saudi students. The initiative aims to advance financial education and journalism in the Kingdom of Saudi Arabia through training conducted by Matthew Winkler, Editor-in-Chief Emeritus of Bloomberg News, and more than 20 Bloomberg journalists and analysts from London and the Middle East. 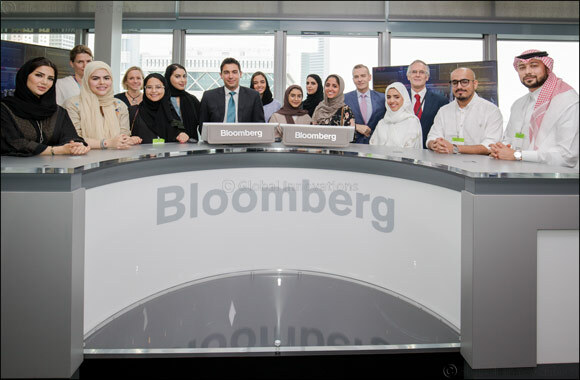 The course is based in Bloomberg’s newsroom in Dubai, where students are learning about Bloomberg's brand of data-driven journalism in the news organization's largest Middle East bureau. The Saudi participants, whose majors include finance, marketing, communications and politics, were all selected for their strong interest in journalism. During the week, the students are learning firsthand about covering regional markets, reporting on companies and finance, journalistic ethics and principles, and multimedia journalism. They will also hear directly from several senior Bloomberg News reporters from the Middle East and beyond on their own experiences, including female reporters who will discuss their careers as women in journalism in the region. Thirty aspiring Saudi journalists -- 22 women and eight men -- participated in the first edition of the program, which took place in January 2018. Their majors ranged from journalism and marketing, to finance. These training programs follow the signing of an agreement between Bloomberg and the Misk Foundation in November 2016 which explores a number of joint initiatives. The collaboration sees Bloomberg develop and deliver cross-disciplinary education and training programs focused on business, economics, finance and journalism to enhance the skills and knowledge of young finance and media professionals in the Kingdom of Saudi Arabia. This extends Bloomberg’s global financial journalism training programs, which include the Bloomberg Media Initiative Africa, the Bloomberg - UNC - Berkeley Business Journalism Diversity Program in the US, the Asian College of Journalism - Bloomberg Postgraduate Program in India and the Tsinghua University Global Business Journalism Program in China.